Home > Business > JUNK STATUS IS NOW A REALITY – HOW WILL IT AFFECT US? 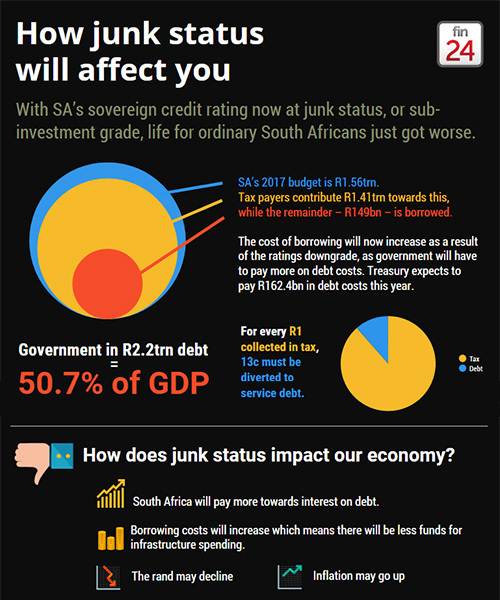 22 May JUNK STATUS IS NOW A REALITY – HOW WILL IT AFFECT US? Events have moved swiftly – on 31 March the Minister of Finance and the Deputy Minister were axed. Ratings agencies Fitch and S&P downgraded South African debt to junk status the next week. Yet there have been consequences – interest sensitive stocks have dropped R190 billion, South African bonds have shed R100 billion in value, the Rand is 10% weaker versus the US dollar and the cost of financing South African debt has increased by R1 billion per year. 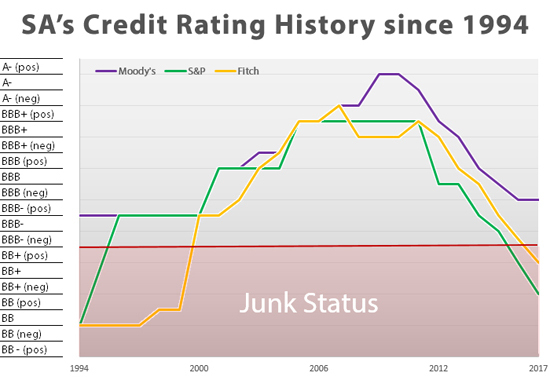 Two of the major rating agencies – Fitch and S&P – have downgraded our foreign denominated debt to junk status. Fitch has also downgraded our Rand denominated debt. Usually for rating downgrades to trigger selling of country assets, two of the three agencies need to declare junk status. As our foreign denominated debt is only 10% of our debt, the response has not been as dramatic as many expected. If our local debt receives a downgrade from Moody’s (they are deciding how to react to March’s events) this will have a much greater impact, particularly as 35% of local debt is owned by foreign investors. The new Finance Minister and his team need to rapidly re-establish credibility in the Treasury. The path of only paying what the nation can afford should remain in place and controls over State-owned entities (such as Eskom) should also be built on. Mr. Gordhan had the confidence of offshore investors and both Fitch and S&P made it clear they feared that South Africa would not stick to current Treasury policies. Move along the path feared by ratings agencies which will lead to further bailouts of State businesses and increased government spending, e.g. on the nuclear program. This way will lead to lower or no economic growth and a steady downward spiral which could end up in further downgrades and an IMF bailout. Maintain the fiscal stance of the last twenty years which could prevent further downgrades and see the country in a year or two emerging from junk status. There will be less disposable income as petrol price hikes, a declining currency, more interest rate rises and stagnant economic growth curb our ability to improve living standards. What is concerning is that surveys show that 30% of even “well-off” South Africans (i.e. they live comfortably and can cover future unplanned expenses) would struggle with an unexpected bill of R20,000. More and more people live at the margin and will be at even greater risk from the downgrade. We can also expect unemployment to rise and investment to drop (particularly as foreign investment will substantially reduce). Considering GDP per head has not grown since 2013, you have to question how long the social fabric can hold. A global organisation which focuses on internal (i.e. management, owners and staff) fraud, recently released some sobering findings. Understanding them is your first step in protecting your business from serious loss. Over 60% of frauds were committed by people with a degree (in view of the large number of fake degrees consider carefully checking qualifications when hiring). 82% of perpetrators were male with an average age of 38. 18% came from the accounting department, 17% from operations and 11% from purchasing. 5% of revenues are lost due to fraud. This applies to large and small entities but clearly will have a greater impact on small entities. The best method of fraud detection is by tip-off (approximately 30% of cases), followed by management review (15%), internal audit (12%) and account reconciliation (just under 10%). If you don’t have a tip-off or whistle blower policy, now is the time to do it. Most of the other detection methods come from active management control. Most frauds come from asset theft and the largest (by value) from financial mis-statement. 90% of background checks did not pick up any indication of malfeasance and 82% of fraudsters had not been punished by their organisations. Something also to consider – and check with previous employers – when recruiting. Fraud losses were detected much faster and the loss was 34% less in entities with strong controls. Family difficulties such as divorce. Don’t become a “fraud statistic” – analyse the risk factors listed above and take preventative action now! The government spends over R500 billion annually on goods and services. Promises have been made for several years that government would promote small and medium-sized businesses (SMEs). Government has also promised to help emerging Black business through its Broad Based Black Economic Empowerment (BBBEE) program. Now it has taken steps to follow through on this. From 1 April, new preferential procurement regulations have come into effect that favour SMMEs and BBBEE firms. The aim of these regulations is to channel R150 billion in procurement spend to these entities. New regulations from 1 April – how will they work? State and parastatal tenders depend mainly on price. In terms of the new regulations the percentage of points awarded for a tender that depend on price is 80% for tenders of R50 million or less, and 90% for tenders over R50 million. In essence this excludes companies that do not have the above criteria. Thus, the state has put in the conditions for a large slice of its procurement to go to SMMEs and BBBEE businesses. It is now up to government and parastatal entities to use these new regulations. SMMEs and BBBEE organisations should now follow tenders closely to see if they are eligible for a slice of this R500 billion spend. In the last few years in particular we have been aware of tax increases. The Free Market Foundation measures how many days in a year it takes to pay our taxes (taking total taxes over total earnings – obviously in reality we pay taxes monthly, or twice-yearly for provisional taxpayers). Compared to last year, it will take us two more days to pay tax – on 22 May we will have settled our owing to SARS and only from the 23rd will we work for ourselves. That’s 142 days (4 months and 22 days) we’ve worked for the taxman. Since 1994, the number of days taken to pay tax has risen by 29 days – if we stick with the current trends, it means that each successive generation will work one extra month to pay tax. It depends how government is spending its money. If the money is going on infrastructural projects that will increase productivity, this will increase economic growth over the medium term. In South Africa’s case the major trend has been the increase in the number of civil servants employed. Since 2009 our debt to Gross Domestic Product (GDP) has doubled which has put the country under unnecessary pressure and is one of the factors that alarms rating agencies. One of the issues that worried former Finance Minister Gordhan was the sudden decline in “tax buoyancy” which measures how revenue collections respond to changes in national income. For example, tax buoyancy would be positive if GDP rose by 1% and revenue collections increased by 2%. In the 2016/17 year SARS fell R30 billion short of its collection target for the first time since 2009. Potentially this can mean that taxpayers are taxed to the hilt (remember 4% of the population pay the bulk of our tax) or perhaps more worryingly, what amounts to a tax revolt is beginning. The people who pay most of our tax have the resources to avoid tax (remember that whilst “tax evasion” is illegal, “tax avoidance” using tax laws legally is allowed) or to find work in another country. The Companies Act gives directors substantial leeway to run a company and gives them considerable powers to do this. So how does it protect minority shareholders who disagree with how the directors operate the business? Scheme of arrangement being entered into by the company. A shareholder may ask the court to protect his/her/its rights in matters affecting the MOI, company rules and company debt. A shareholder may apply to court to have one or more directors declared delinquent. If shareholders are being treated in an “oppressive” or unfair manner which prejudices their rights, the courts are given wide discretion. Inter alia, they can appoint new directors, restrain behaviour, change the MOI, award compensation to the prejudiced shareholder, issue shares, set aside transactions or require a trial be held. The Supreme Court of Appeal in 2013 found in favour of a minority shareholder under this section. Shareholders may institute a derivative action by demanding the company take legal action against wrongdoers who have acted in a manner harmful to the company. Whilst we are often told the Companies Act favours directors, there are numerous avenues sanctioned by the Companies Act to address grievances of minorities. Ask your accountant for help in doubt. Your Employer Annual Reconciliation (EMP501) is due on 31 May. Don’t underestimate the amount of work involved in preparing and submitting this form, and ask your accountant for help in any doubt.